Will the Mariners add another feather to their hat or will Aizawl FC script another Leicester City story?The champion of Hero I-League 2016-17 will most likely be decided today when Mohun Bagan face Aizawl FC in the most awaited tie of the season. All Green and Maroon supporters still have a clear picture of a similar battle that took place at the Kanteerava Stadium back in 31st May 2015, the opponent was Bengaluru FC and 87th minute strike from Bello Razaq handed them the I-League title. This time its not Bengaluru FC and neither its their arch rivals East Bengal, the opponents are a well greased troops under the watchful eyes of Khalid Jamil. Having hardly put a foot wrong throughout the season, both teams will relish the opportunity of completing the triumph with a game to spare. Darryl Duffy(10) and Kamo Bayi(7) lead the scoring charts for their respective team while both teams possess a great amount of creators. Young lads like Vanlalremdika and Azharuddin Mallick have already shown their mettle for their respective teams. 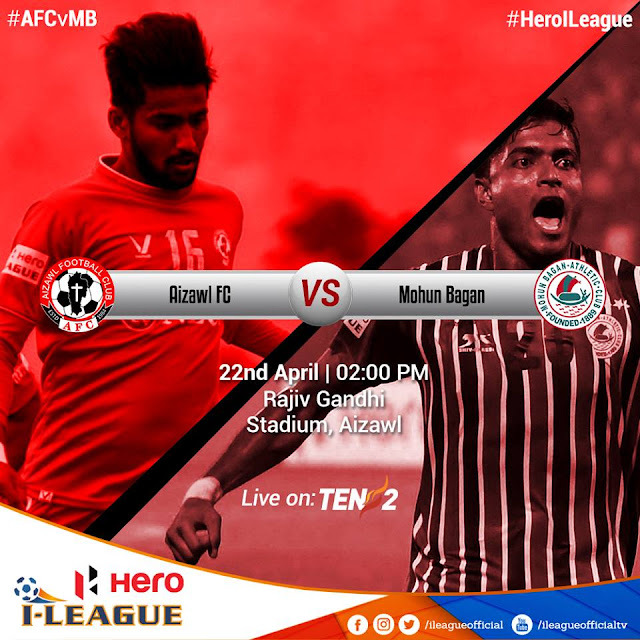 Sony Norde(Mohun Bagan) and Mahmoud al Amna(Aizawl FC) could prove to be the key differentials but there are so many names who have been consistent throughout the season. Mohun Bagan having a better head to head record can afford a draw but Sanjoy Sen is hardly a man who believes in taking the league title to the last game. All questions will be answered when the two sides face-off in the potential title decider at the Rajiv Gandhi Stadium on Saturday, 22nd April 2017. The game kicks off at 2 PM IST and will be telecast live on Ten 2.